Sometimes your phone gets too laggy to be usable and you just want it back to the state when it was new; or you just forgot your password. In the case on an iPhone 7 Plus, you hard reset it. Here’s how you can hard reset your iPhone 7 Plus. Connect your iPhone 7 Plus to the computer while still powered on. Turn off your iPhone 7 Plus completely while connected to the computer. Confirm the dialogue box that you see on your computer and wait while iTunes restores your iPhone 7 Plus. When reformatting and resetting was successfully completed, set up your iPhone 7 Plus using SET UP AS NEW IPHONE. Safely remove your iPhone 7 Plus from your computer when setup is complete. Click the button to learn more about the features of the new iPhone 7 Plus. 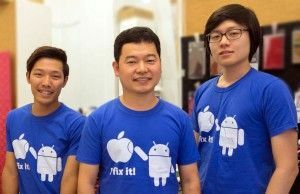 Let the Sydney CBD Repair Centre Team help you reset your iPhone 7 Plus! We specialize in Screen Replacement services.